8th graders will practice with the CHS Marching Band on Monday, October 12th from 7-8PM. They will play pregame on Friday, October 16, 2015. 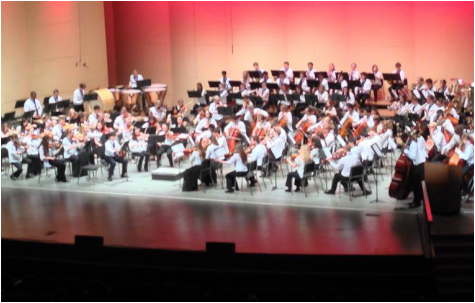 Concert attire: Students are required to wear black pants or skirt, black shoes and black socks, and a white, collared shirt for their concerts. Santa hats are ok for the Holiday Concert. If you are interested in participating in Middle School Jazz Band, see Mr. Raaymakers. The Caledonia Pipes and Drums is a school and community partnership located in Caledonia, Michigan that provides piping and drumming instruction to the students of Caledonia High School and the community. The group performs regularly throughout West Michigan. Visit their website. 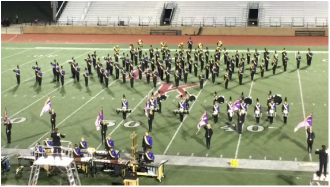 After marching band season has ended, each high school band student is enrolled 2nd & 3rd Tri in a concert band which includes Freshman Band, Symphonic Band or Wind Ensemble. Each student is assigned a uniform for concert band and will take the concert uniform home. Girls are fitted for a top and skirt. Males are fitted for concert pants and tuxedo jacket (not freshman band). All males must supply their own white shirt .They will be assigned a bow tie and cummerbund the evening of concerts. Black shoes are required and the black marching band shoes (Drill Masters/Dinkles) are acceptable footwear (for males). Black socks and/or tights are required under skirts and pants. Students are expected to arrive to the concert already dressed in full concert uniform. Uniform fittings generally happen in early November while they are technically still in Marching Band. Returning students need to try on their current uniform at home and decide if a new size is needed. Uniforms are assigned to new concert band members during the new student fittings. Concert Bands uniform cleaning and hemming are the student's responsibility. The uniform must be returned at the end of the student's senior year or pay a replacement cost. The goal of this class is to give every student a solid grounding in the style, performance, theory, and history of Jazz in the 20th century. These goals will be accomplished through the applied performance of jazz music in the classroom and during public performances. All students enrolled in Jazz Band will be able to learn and grow as musicians regardless of previous experiences playing jazz music. Throughout the course of the year students will also be exposed to a variety of styles including, but not limited to, Latin, Blues, Ballads, and Rock and Roll. Students will also be given the opportunity to learn jazz improvisation, as well as techniques for playing jazz in a small group setting. More information on our Marching Band page. Come out for our performances. Click here for a 2018 Sponsorship Form.